Vata is composed of the Space and Air elements. It is considered as the leader among the doshas as it is the most challenging to bring under control. People of Vata constitution are extremes, either very tall or very short. It is quite likely that you are thin, with a slender frame and protruding joints. This doshic type typically has dry skin and hair and cold hands and feet. Vata controls all movement in the body, from transporting substances across cellular membranes to gross physical movements. 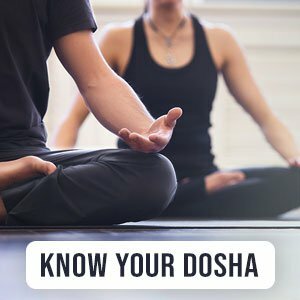 The main area of this dosha is the nervous system. Your movements are quick as is your speech. You tend to learn quickly and also forget equally quickly. A Vata-dominant person is characterized by movement and change. You are likely to always be on the go, with a mind that’s creative, flexible and energetic. Artistic Vatas may find themselves pursuing luxuries. As a Vata, you are usually bubbling with a sense of enthusiasm, but you tend to run out of steam and wear down easily. When out of balance, you are prone to anxiety and fear, which in turn may lead to sleeplessness, hypertension and digestive challenges. To keep your constitution in balance, choose a lifestyle and diet that is stable and grounding. Follow a routine as far as possible. Eat foods that are warm and keep warm. Stay nourished and fulfilled physically, mentally and emotionally.